According to a friend who is also a meterologist and wave guru (and who took the picture you see above) the icebergs are on their way. 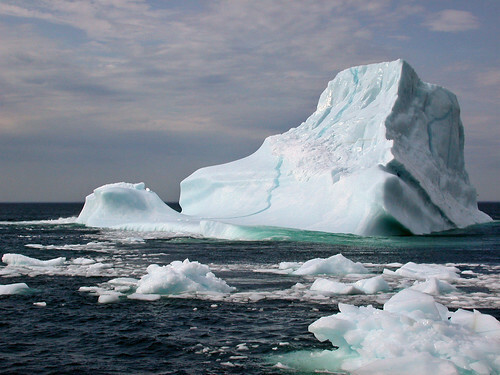 After a quick check of my flickr photos, I noticed that I actually don't have any iceberg shots. Nada. I'm sure I have some taken with film somewhere, but this digital camera is a fairly recent acquisition (end of September of last year) and hasn't had an iceberg season to capture yet. So I present to you one of Rexton's excellent photographs and the promise that there will be a field trip to find bergs at some point in the next couple of weeks. Possibly next weekend, which is a long weekend in Canada. Meanwhile, I'll watch the iceberg reports and dream of days when I didn't have a screaming, rock-throwing, kite-flying fiend attached to my leg. Snapping back to reality. Sorry 'bout that. After the bergs come, we'll have whales…. Another subject matter of which I have no digital photos. Since I’m landlocked the concept of going down to the shore to view the ocean is a totally foreign thing for me. And then to see icebergs and whales! Wow!